I’ve wanted to get into Manchester Orchestra for some time now given that they are named after the UK town that churned out seminal bands like Joy Division, The Smiths, and The Stone Roses along with later bands such as The 1975, and my personal favorite, Elbow. I imagined working class songs with a clear homage to the bands listed above. Rock/Alternative peppered with classical orchestral arrangements to give them a unique edge. That is not what I discovered to be the case. I haven’t dug what I’ve heard over the years but maybe that was because my image of them couldn’t reconcile itself with their actual sound or maybe I just wasn’t ready. Lately when “The Gold” comes on the radio I find myself turning up the volume so why not check out their new album? The band was formed in Atlanta in 2004. After a decade growing with four studio albums released, only two original members are left standing; singer-songwriter and rhythm guitarist Alex Hull, and lead guitarist Robert McDowell so I can imagine that their sound has evolved over all these changes and growing pains. I won’t pretend that I know this for certain. Instead I am going to approach this album as a stand-alone product- no drama. I unfortunately have to say that while listening I couldn’t stop myself from being reminded of Band of Horses given the albums ambiance and Hull’s similar vocal style and of Turin Brakes with the same cartwheel pop some of the songs churn out. 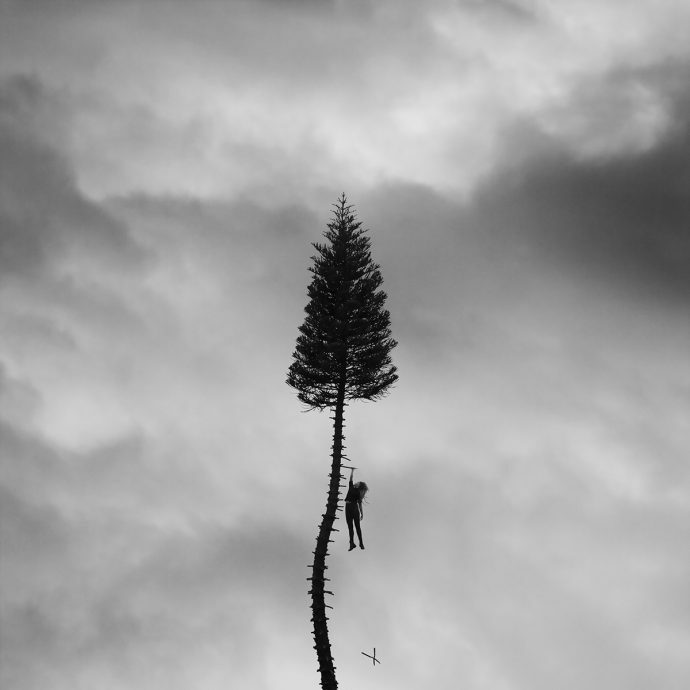 The disappointment comes because I was still hold on to my thought that Manchester Orchestra’s sound would be singular. Drama however is apparent throughout the record. Not in your old fashioned you broke my heart by doing or not doing this and that although we have touches here and there but more so in that we are watching a science fiction movie unfold narratively and sonically in front of our senses. More so like a TV series. Every track, a single episode represented with a “the” before a single word; “The Maze”, “The Moth”, “The Mistake”, with the exception of one; “Lead” – which I suppose is where our stories take place but we don’t find out where we are until track four. This show is probably like Supernatural. The lyrics and haunting sounds – sometimes brought on by a chanting chorus in the background warning us not to look inside to the point of screeching, a synth, or guitar fuzz. With tracks like “The Grocery” and “The Wolf” that represent this alternate reality, it’s not hard to see that the band is running from something – whether or not it’s a hallucination is yet to be determined. “The Moth” itself feels like a chase scene. Oddly enough “The Alien” is a sweet lullaby with twinkling keyboard plinks. There are some strong songs, those that anchor the characters to this place by love. “The Gold” mentions how he “couldn’t really love you anymore, you’ve become a ceiling.” “The Parts” is a beautiful piece with echo vocals that offer a plea of longing; “I’ll be a page in your book if you’ll let me.” “The Maze”, the album’s opener, is an ode to an amazing person with rising voices in praise of “unspeakable love” that is honoured by its rising promise of what’s to come, encouraging you to venture fourth. Other-worldly things plague this town in the form of ghosts. You can hear the haunting in the lyrics and the music. Although the tracks bleed into each other like a Pink Floyd record and electronic pulses reminiscent of Radiohead and Muse are sensed throughout, these facets along with emotional delivery give this record a distinctive sound, one that is enjoyable. The album’s closer, ironically titled “The Silence”, is a cliff-hanger for next season. It’s the kind of song that could have been placed first in the track listing and yet makes sense for the last song we hear because it certainly is a goodbye, at least until the next time. I’ll be tuning in again.